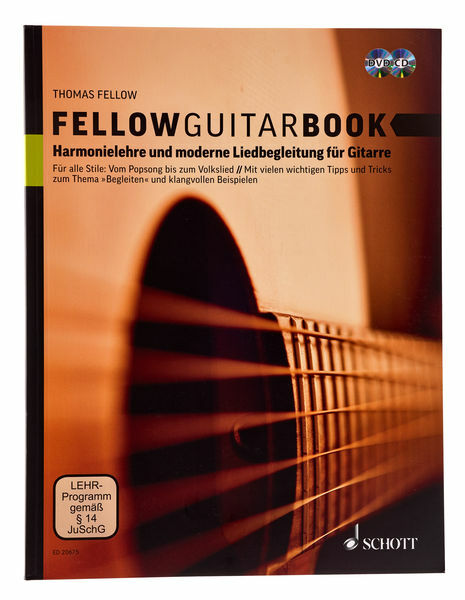 Guitar SchoolThe "Fellow Guitar Book" represents a sound and inspiring addition to guitar lessons at music schools, conservatories and universities, and can be used for training as a concert or jazz guitarist as well as for school-practical lessons or autodidactic self-study. Thomas Fellow (Professor of Acoustic Guitar at the Musikhochschule in Dresden) is giving his guitar bookers all the guitarists the opportunity to learn new tips and tricks on the topic of "accompany" and presents a harmonica for the guitar, the foundations for all styles - from jazz to pop and rock to chanson and folk song. The course contains both a CD with numerous audio samples as well as a DVD, on which complex stop techniques can be illustrated clearly.